The Visual Arts departments at The Sixth Form College, Solihull and Ninestiles School, an Academy, worked together on an exciting community project at the end of the Spring term. 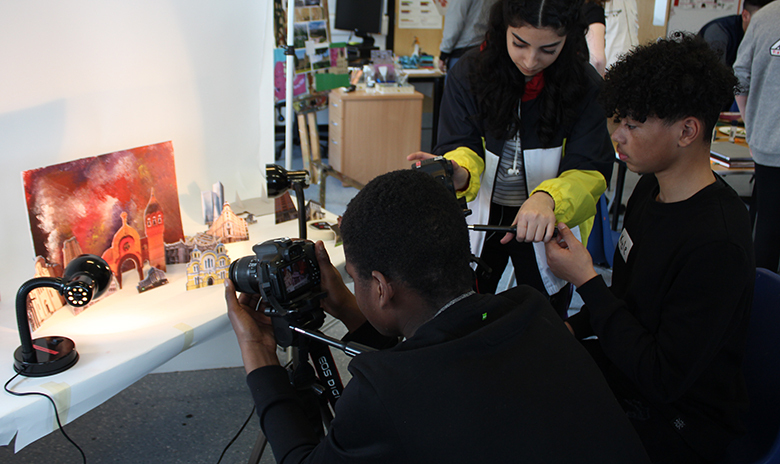 Just before the Easter break, Year 10 Visual Arts students from Ninestiles School visited the College to work with our BTEC Art & Design students on a community art project. They focused on the College’s three Visual Arts specialisms: Fine Art, Graphics and Photography. The brief our students were given was to work as community artists to research, plan and deliver a workshop for the Ninestiles students. The aim of the project was to be as authentic to the idea of community art as possible, which meant engaging with the community, in this case with the Year 10 students.